According to the U.S. Department of Energy’s Pollution Prevention Requirements, the first step in revitalizing a cleaner nation is pollutant source reduction. AMSOIL accomplishes this by extending the interval between motor oil changes which can reduce the source of motor oil pollution more than eleven times. In 1993 an estimated 189.5 million motorized vehicles were on the road in the United States alone, and an estimated 700 million motorized vehicles were in operation throughout the world. If, by petroleum oil manufacturer’s recommendations, these vehicles have their oil changed every 3,000 miles on an average five-quart system, almost 1 billion quarts of used oil will be generated each month. So are we drowning in oil? It is estimated at present that over 240 million AMSOIL - The Right Environmental Choice for businessesgallons of oil are improperly discarded annually. Dumping 240 million gallons of oil is nearly the same as two Exxon Valdez spills each month. How dangerous is used oil? Just one quart can produce a two-acre oil slick. One gallon of oil can make one million gallons of water too foul to drink and 35 ppm of oil will kill fish. Improperly disposed used oil is dangerous. Improperly dumped used oil seeps through landfills into ground water, disrupts bacterial digestion in sewer treatment plants and washes into lakes and harbors. At present, used motor oil is the largest single source of oil pollution in our nation’s waterways. Certainly the first thing we can do is not create so much used oil to begin with, and we can recycle the used oil we have. Both synthetic and conventional motor oils can be recycled at any used oil recycling center. Most automobile manufacturers recommend oil drain intervals of 3,000 to 6,000 miles for petroleum motor oils. AMSOIL recommends up to a 35,000-mile oil change which is 5 to 11 times fewer oil changes. Just think about the savings on the environment if, for example, the 135 million cars (excluding trucks, buses and taxis) in the United States were equipped with AMSOIL motor oil. Assuming an average service-life of 100,000 miles and an oil capacity of 5 quarts each, 11.4 billion to 22.3 billion quarts of used oil will be generated during a regular service lifetime (with regular oil changes every 3,000 to 6,000 miles). If you put 22.3 billion quarts of used oil into 55-gallon barrels and loaded them onto semi-trucks, a line of trucks would stretch end-to-end from Los Angeles to Washington D.C. and back to Los Angeles. For nearly three decades, AMSOIL INC. has been recognized as the leader in synthetic lubrication technology. AMSOIL was the first to introduce a synthetic motor oil qualified by the American Petroleum Institute, the first to recommend 25,000-mile/1-year drain intervals, the first to recommend 35,000-mile/1-year drain intervals, and the first to implement a system for dramatically increasing drain intervals with oil analysis. Decades of research, laboratory analysis and millions of engine miles have kept AMSOIL the leader in automotive applications for synthetic lubrication. Although the results have paid off in maximizing efficiency and minimizing waste, they are not conclusive. AMSOIL is the leader in synthetics and with continued research, analysis and product development will remain the industry’s leader. In 1983 AMSOIL created the TRI-GARD system. The life of a lubricant is dependent on the quality of oil and the filtration systems ability to keep it clean. The AMSOIL TRI-GARD system incorporates AMSOIL Synthetic Motor Oil, the AMSOIL Foam Air Filter, the AMSOIL By-Pass Filter and oil analysis to dramatically extend the oil change interval. Less oil changed means less oil disposal and less oil pollution. With regards to the environment, the AMSOIL Tri-Gard System is the most technologically sound, environmentally friendly motor oil program to reduce oil disposal. Increases Engine Life Each year nearly 600 million gallons of motor oil are burned and exit through the tailpipes of cars and trucks, creating emissions pollution. Petroleum oils volatilize (burn off) more readily than AMSOIL synthetic oils and create more emissions pollution. The graph at the right shows the results of six oils that underwent the NOACK Volatility Test. 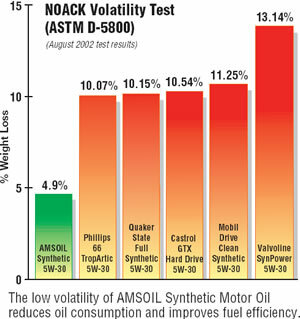 Of all the oils tested, AMSOIL shows dramatically less weight loss. Less than half the weight loss of its closest counterpart. Some oils tested lost almost 20 percent of their weight. That means almost one fifth of the oil boils away and is released into the environment. For most cars, that’s approximately a quart of oil being burned and expelled into nature. The thicker oil left behind after volatization contributes to damaging deposits, sticky piston rings and oil blow-by, all of which cause reduced engine life, reduced fuel economy and increased air pollution. The advanced lubricity (slipperiness) of AMSOIL synthetic lubricants has been proven to increase fuel economy by 2-5%. AMSOIL reduces friction and allows your engine to use its heat energy more efficiently. If 800 million vehicles change oil 3 times each year and have 5 quart systems, 1 billion quarts of waste oil will be generated each month.